Learning God’s Word is a lifelong journey, and the first steps of this road are best taken in the home. 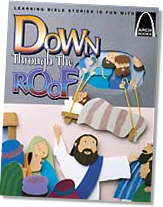 Arch® Books are a great start for parents and children studying Scripture together. The back of each book puts the story in context and comments on important themes, helping families spark valuable faith conversations. Arch Books are excellent for any time of day—keep them by the kitchen table, on the playroom bookshelf, or in the car. Read and discuss in just minutes when time is short, but put these activities in your pocket for extra fun! 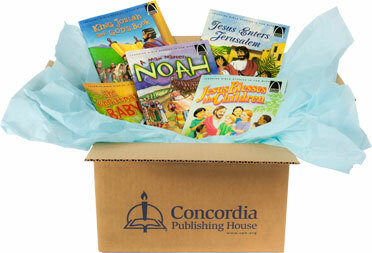 The text and illustrations of Arch Books are copyrighted by Concordia Publishing House. Limited permission is granted for their use as outlined below. Use this key as a suggestion for the average age range that works well with each activity below. 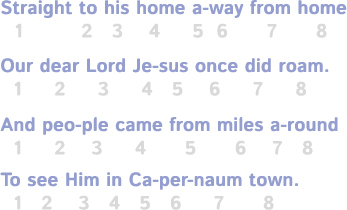 You can sing the text of most Arch Books if the story is written in a rhyming meter that matches the syllable count of a hymn tune. Usually, the number of syllables in each Arch Book stanza will work with *common meter (8 6 8 6) or *long meter (8 8 8 8) tunes. The Arch Book Down Through the Roof is in long meter, meaning there’s eight syllables in each line. Use the metrical index in the back of a church hymnal (Pg. 1007 in the Lutheran Service Book) to find tunes that will work for your Arch Book music. The above stanza can be sung to the tune Duke Street, or "I Know that My Redeemer Lives." Your child will love turning favorite stories into songs! Reading an Arch Book can inspire your young author or artist to write and illustrate his or her own rhyming Bible book. Select a story from Scripture together and let your children draw what they hear. Then, retell the story in a really simple rhyme written on the bottom of each paper. The final product can be in print or digital form! You can bind the book using staples, yarn, or another material of choice. Make a digital book by taking pictures of your child’s work with your camera or phone and placing them in a PowerPoint or other movie-making program. Cut two of the books in half along the gutter, and use your third book as a reference. Hide the story’s text under a piece of paper or use scissors to cut it out. Put the story in order and mount the pages on your poster board. If you choose, laminate the posters. Help your children retell the story using original words, writing the story at the bottom of the poster board pages. To brainstorm, review the Bible account by rereading the Arch Book or speaking the words straight from Scripture. Display your new story for the family to see! *For younger children, the pictures on poster board become a “puzzle” that they can put in story order. **Arch Book illustrations are to be used for this activity only. You may not use these illustrations for any other purpose. Acting out an Arch Book is a great way to get the whole family involved in Bible learning! You or your older children can narrate a story while younger children act out various characters with their facial expressions, tone of voice, and delivery of simple sentences from the book. Make sure you have a video camera nearby!